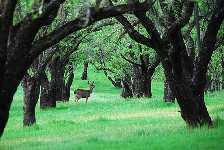 There are many different types of deer repellents at the disposal of commercial nurseries and orchards. They include taste repellents, odor repellents, and mechanical repellents. The latter category tends to not be used in commercial applications due to the large scope of the area to be protected and the cost involved in setting up a mechanical system. This leaves taste and odor based repellents. Most commercial nurseries and orchards will use a combination of these repellents to elicit the best results. Taste based repellents are designed to give an unpleasant taste to any plant that deer should not be nibbling on. This makes the plant less palatable to the deer, thus deterring him from eating them. Most taste based repellents come in liquid form and is applied directly to the surface of the plants by spraying. This type of repellent does not alter their appearance of the treated plants at all. Some taste based repellents can actually be absorbed by the plant itself, creating provides a residual action, and reducing the amount of applications of the repellent. In this situation, the repellent is sprayed on the immature plants and is absorbed by the roots. The repellent remains in the plant, unchanged, as the plant grows, giving it a lifetime of protection against hungry deer. The major drawback of a taste based repellent is that the deer must actually consume part of the treated plant before being deterred. The other drawback is that few taste-based repellents can be used on food plants. Odor based repellents, on the other hand, play on the deer’s sensitive sense of smell. The odor emitted by odor-based repellents will deter deer well before they reach the plants that are being protected. Odor based repellents can be applied either directly to the plants to be protected or into containers located along the perimeter of the nursery or orchard. The latter application is generally used due to the fact that it reduces the amount of applications necessary to protect plants, as the repellent is not washed off after rain or watering. Some odor based repellents use ingredients such as rotten eggs or animal parts to impart an offensive odor. Others rely upon the use of authentic or synthetic predator urine to ward off deer. Just like taste-based repellents, odor based repellents can come in a liquid form and can be applied by spraying, or in a solid form that can be installed in a dispenser if the nursery or orchard does not wish to directly apply the solution to the plants. Another method for using liquid odor repellents is to soak a porous rope in the solution and create a fence around the perimeter of the orchard or nursery. Deer will rarely cross these fences, choosing instead to find easier pickings elsewhere. Both methods have their pros and cons. The biggest reward for using a taste or odor based repellent is that in areas that have light to moderate deer populations, deer can be easily and cost effectively deterred from eating the plants. Repellents do not alter the physical appearance of the landscape or protected plants, and are easy to obtain and use. The drawbacks is that both types will need to be reapplied several times throughout the growing season, and, depending on the size of the application area, they can be costly. Repellents alone are sometimes not enough to discourage determined deer and are best combined with other forms of deer control, such as fencing. Please check out our page with information about Milorganite. It is a cheap deer repellent and for vinyards, orchards, and field nurseries is a great choice for deer control while offering the benefits of a natural fertilizer. Deer Out is a well know commercial deer control. Available in 2.5 gallon containers, this is a good year-around deer repellent or a good choice for switching the repellents to confuse the deer. Deerbusters premium liquid repellent repels deer by taste and odor. Highly tested ingredients of putrescent egg, garlic and hot pepper make the repellent safe to children and pets. Forms a long lasting year round foliar spray for shrubbery, trees, flowers and ornamentals. These natural ingredients will not leave an offensive odor to people and our repellent can be applied without fear of discoloration or residue on flowers and other delicate plants. A special rain resistant formula allows for up to 3 months of residual on all plant types. Deerbusters Deer Repellent Sprays have also been used to repel rabbits. Treats 3000 to 4000 4 ft high shrubs or flowers. Makes 20 Gallons. Millers Hot Sauce Deer Repellent repels deer rabbits and mice. Effective on fruits nut trees vegetables vine crops and ornamentals. Mix 4 ounces of Hot Sauce with 1 Quart of Vapor Gard to 50 gallons of water. Includes visual scare devices & Ultrasonic BroadBand pest control device. Bird-X has pioneered and led the field of bird and pest control since 1964. Their products in a word work. The Bird-X BroadBand Pro is designed specifically to eliminate bird nuisance on billboards signs towers and the like and does the job well. Solves bird problems for billboards signs towers roofs and more Distress cries indicating danger target Pigeons Seagulls and Starlings Three Predator Cries add terror and realism scaring them away Three Harassments deliver an all bird defense and add an extra incentive to leave Powerful Ultrasonics round out the sound attack keep them away all day and night complete with the three 3 visual scare devices of irritape terror eyes and the prowler owl as shown below Covers one billboard any size double or single sided Ultrasonic sounds cover up to 6500 square feet Sonic sounds cover up to 6 acres Clicking sound from the main box is made when the sound changes from one speaker to another The Bird-X BroadBand Pro is designed to protect billboards signs towers roofs and more from pest birds of all kinds. The Bird-X BroadBand Pro uses an unrelenting combination of species-specific stress cries predators general harassments and newest technology ultrasonic waves to accomplish that goal and accomplish they do.